Valladolid is a small and charming colonial city located in the centre of the Yucatan Peninsula (two hours from Cancun and two and a half hours from Merida) with pastel-coloured low-rise buildings and narrow cobble-stone streets. It is a beautiful city and there are so many fantastic photo opportunities! I spent four nights in Valladolid during my first solo trip, staying at Hostel La Candelaria from May 27 to May 31, 2015. Most tourists only spend a night or two in Valladolid, because of its central location to the Mayan ruins like Chichen Itza and Ek Balam as well as many cenotes. However, I think this city is amazing and well worth a longer stay to experience all that it has to offer. Valladolid is located about two hours west of Cancun or two hours east of Merida, pretty much in the centre of the Yucatan Peninsula. The city was named one of Mexico’s “Pueblos Magicos” (magical towns), which is a distinction given to towns in Mexico based on their natural beauty, cultural riches or historical relevance to the country. The city was formed in the 1540s on top of the former Mayan town of Zaci. This city has a lot of interesting history and there are plaques throughout the city at various places of historical significance, explaining the history behind that particular location and its relevance to the city. It is truly a beautiful and well-maintained small city. It felt authentic and the Mayan culture was very prominent, in the cuisine and especially in the clothing that the locals wore. Valladolid is the perfect place to stay if you plan on visiting the surrounding ruins and cenotes, like Chichen Itza, Ek Balam, Coba, Cenotes Xkeken and Samula and others. It is centrally located and is in close proximity to stunning ancient Mayan ruins as well as natural beauty in the form of a variety of gorgeous and off the beaten path cenotes. The Ek Balam ruins are located only 20 minutes to the north, Chichen Itza is located 45 minutes away, the ruins of Coba are located 1 hour away, and there are cenotes within biking distances (4-7 km) south of Valladolid (Cenote San Lorenzo Oxman and Cenotes Xkeken and Samula). Valladolid is a tranquil and charming small city with pretty cobblestone streets and colourfully painted colonial buildings. The central plaza and cathedral are gorgeous – relaxing and peaceful during the day and vibrant and full of activity in the evenings and at night. It is an amazing city to explore and just wander around. The Mayan culture is very prominent in Valladolid. You will see Mayan men and women wearing their traditional clothing, making traditional handicrafts to sell on the street or at the market, cooking traditional meals, and speaking their native languages. Learning about the Mayan culture is fascinating for me, and Valladolid is the perfect place to learn more about it and become immersed in the local culture and language. Valladolid is located a little further off the beaten path than the coastal areas of Tulum and Playa del Carmen, which is great if you love being one of the few tourists around. I could walk around the streets of Valladolid and not see a single other tourist. It’s a fantastic opportunity to practice your Spanish by interacting and connecting with the locals. The colourful and colonial architecture in Valladolid is beautiful. Every building is painted a different colour or shade, and there are so many unique designs of doors and windows to be discovered by wandering around the city streets. If you are a photographer, Valladolid offers so many fantastic photo opportunities, from the unique doors and windows on the colonial buildings, to the amazing architecture, to the many colourful and retro VW Beetles, and much more. The cheapest and best time to visit Valladolid, in my experience, would be the shoulder-season months of May and November. During these times is when you will find the least amount of tourists and crowds and the best prices on accommodations and flights. The weather is hot and humid during May with average temperatures of +35 degrees Celsius in Valladolid. I didn’t experience any rain during the month of May. The most popular times to visit Valladolid are between the months of December and March. This is high season, and there will be more tourist crowds, and higher prices for everything. The weather is “cooler” during these months – around +26 degrees Celsius on average. Valladolid is designed similarly to many other Mexican towns and cities. There is a central plaza or park in the centre of the city (bordered by Calles 39 and 41 on the north and south side and Calles 40 and 42 on the east and west side), which is the main place where locals congregate and socialize in the evenings and on weekends. The streets are laid out in a grid pattern. Even numbered streets run north to south and odd numbered streets run east to west. I loved the predictable numbered system of the streets because if or when you get lost, it’s never too difficult to figure out where you are and where you need to be. Check out my guide about the best places to eat in Valladolid for detailed information about where to eat in the city. Getting to Valladolid from anywhere in the Yucatan is easy by ADO first or second class bus. Valladolid has a new and modern ADO bus terminal located at Calle 39 and 46, near the main square. The first class buses provide direct service to the major towns and cities throughout the Yucatan and second class buses also include service to small towns and villages and often stop along the way to their destination. Walk to the ADO bus terminal in Tulum and purchase a first or second class ticket to Valladolid. First class buses cost around 108 pesos one-way from Tulum to Valladolid. There are multiple departures throughout the day. Getting there takes around one hour and forty minutes. The schedules are typically the same every day, but it would be a good idea to check the ADO bus schedule website the day before you leave just to make sure. Second class buses cost around 84 pesos one-way. They take about two hours and five minutes to arrive in Valladolid, because second class buses stop in small towns, villages and along the highway to drop off and pick up people along their journey. There are no direct buses from the Cancun Airport to Valladolid. However, you can take a bus from the Cancun Airport to the Cancun city bus terminal or the Playa del Carmen terminal and then buy another ticket onward to Valladolid. From the city of Cancun, first class buses cost around 186 pesos one-way and they take two hours and five minutes to arrive in Valladolid. There are multiple departures throughout the day. Second class buses from Cancun to Valladolid cost around 105 pesos and they take around three and a half hours. There are buses running throughout the day. Playa del Carmen’s main ADO bus terminal is located on Avenida 5 at Avenida Benito Juarez. From this terminal, first class buses to Valladolid cost 186 pesos and take around two hours and forty minutes to get there. Second class buses cost less than first class buses but they also take longer to arrive, because they stop at towns and villages along the way. I have experience using the first class ADO buses, not the second class, and I chose this option because the buses are more convenient and get you to your destination faster. They were comfortable, air conditioned, and reliable. I traveled on the buses as a solo female traveler and they felt completely safe. There is luggage storage underneath the bus and you will receive a baggage ticket to claim your bag when you arrive. You can check ADO first class bus schedules on their website at www.ado.com.mx and second class bus schedules on www.ticketbus.com.mx. Valladolid is not a very big city and it is easy to get around on foot, to and from anywhere in the central area. I felt very safe walking the streets alone as a solo female traveler during the day and in the evening. Bicycling around the central area of Valladolid might be a little tricky, as the area can get pretty congested with traffic and pedestrians during the day, but as long as you are aware of your surroundings and obey the traffic rules while riding on the streets, you should be fine. Remember, most streets in Valladolid are one-way only, so pay attention to what direction you’re driving in. If you are staying at Hostel La Candelaria, they rent bicycles for 80 pesos per day or 15 pesos per hour. If you need to get somewhere that is further from the central area and you don’t want to bike, you can easily get a taxi. You can either flag one down on the street or approach one of the many taxis parked on the streets around the central plaza. There are also always taxis waiting outside of the ADO bus terminal, although the bus station is only a few blocks from the central plaza area. Always negotiate and agree on a price with the driver before getting in. The taxi drivers in Valladolid only speak Spanish, so you will need to know some basic phrases (like telling them where your destination is and how much it costs to get there). Getting to the nearby cenotes outside of Valladolid (like Cenote Oxman, Xkeken and Samula) is easiest via taxi, but you can also bicycle there. There are random parking lots hidden behind colonial buildings and accessed via a narrow tunnel through the building, where you can find taxi colectivos (shared taxis) and regular colectivos (shared shuttle vans) to and from the surrounding small towns and villages and tourist attractions like Ek Balam and Chichen Itza. These colectivos do not operate on a fixed schedule and they will wait until they have enough people to fill their vehicle before departing. The taxi colectivo parking lot for the Ek Balam Ruins is located on Calle 44 between Calles 35 and 37. There is a tattered cloth sign hanging above the tunnel entrance, which leads to the parking lot in behind. The colectivo parking lot for the Chichen Itza Ruins and the town of Piste is located on Calle 46, just north of Calle 39, and behind the ADO bus terminal. I stayed at Hostel La Candelaria, located at Calle 44 and 35. It was amazing and I highly recommend staying there! You can check out my detailed review of the hostel here. You can check out my detailed guide about other budget-friendly accommodations in Valladolid here. 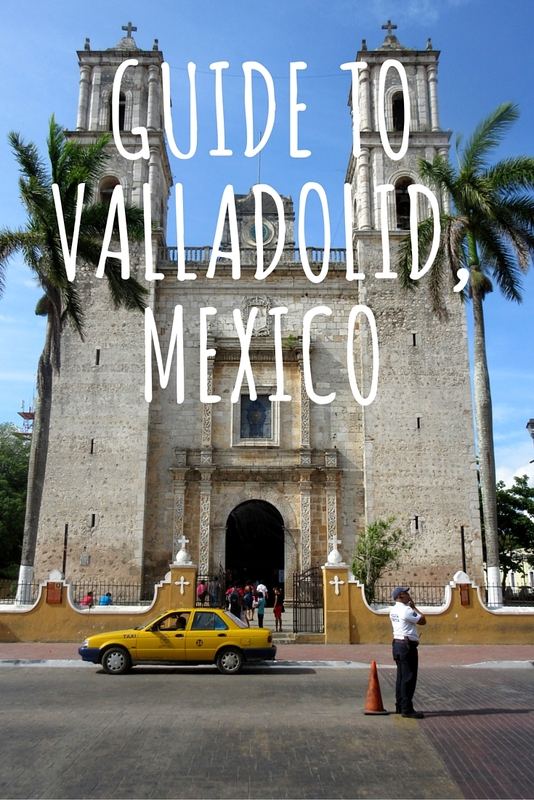 Check out my detailed guide on things to do and see in Valladolid here. Banks and ATMs are plentiful in Valladolid. Most of the banks are located in the area surrounding the central plaza. There is an HSBC (Calle 41 between 42 and 44), Banamex (Calle 41 between 42 and 44) and Bancomer (Calle 40 between 39 and 41). MexiGo Tours is the main tour agency in Valladolid (phone: 985-856-0777) and although I have not used their services, I have heard and read many positive reviews. They are located on Calle 43 between Calles 40 and 42 and they offer small group van tours of the regional attractions, like Chichen Itza, Ek Balam, Rio Lagartos and the town of Izamal. Valladolid has a tourist office located at the Palacio Municipal on the central square (Calle 40 at Calle 41. Phone: 985-856-2529 extension 114). They are open from 9 am to 9 pm daily. I did not visit the tourist office but heard good things about the information and advice they provide. They offer maps and English is spoken. Hospital General is located on Av. Chan Yokdzonot (phone: 985-856-2883), 4.5 kilometers south of the cuota highway. They are open 24 hours. There are many farmacias (pharmacies) located everywhere in Valladolid (on pretty much every street corner, you will find one), for medical supplies and medication. There is a Farmacia Yza located on the central plaza at Calle 41 and Calle 40 (phone: 985-856-4018), which is open 24 hours. The local police are located at Parque Bacalar (Calle 41) and they are open 24 hours (phone: 985-856-2100). For any emergencies in the Yucatan, calling 066 from any phone is the equivalent to 911 in Canada and the United States. Safety for Solo Female Travelers? As a first time solo female traveler, I felt completely safe in Valladolid. You can read more about safety in the Yucatan on this post. You always hear stories in the media about all of the violence occurring in Mexico and about how unsafe and dangerous it is to travel there, but what the media doesn’t tell you, is that these incidents are often concentrated to certain areas of the country (mostly the northern border states and some central states). The Yucatan Peninsula and Valladolid in particular, have a reputation of being the safest places in Mexico. There is virtually no violent crime happening in Valladolid. I walked alone and with friends from my hostel everywhere, during the day and at night, in busy areas and quiet residential neighbourhoods. I never felt unsafe in any way. There was one time when myself along with two female and two male friends from my hostel were walking in the evening together from a restaurant near the convent back to our hostel, and a pick-up truck with Mexican men sitting in the back drove by and the men stared, whistled and yelled some comments in Spanish that we couldn’t understand. We just ignored them and kept on walking. I did feel threatened or unsafe at all. Catcalls from local men directed towards foreign females are common throughout Latin America. Although it is uncomfortable at times, the best strategy is just to ignore the person/people, don’t even acknowledge them and keep on walking with purpose and confidence. Valladolid is a very peaceful, tranquil and slow-paced small city and I would not hesitate to recommend it to other solo female travelers. It is a great place to relax and explore. The Mayan culture is very prominent in Valladolid, from the way the locals dress, to the food, to the language. If you are interested in learning about indigenous culture and history, this is definitely the place for you. There are also lots of small Mayan villages surrounding Valladolid that would make for a fascinating visit. Valladolid is a destination that is more off the beaten path. There are definitely tourists in the city, but I often felt like I was the only one when walking around. You could walk for awhile and not see another Caucasian person or tourist, but yourself. The food is authentic and cheap in Valladolid and you can find a variety of Mexican and Yucatecan specialties (cochinita pibil, poc chuuc, etc.). There are also lots of small shops where you can buy handicrafts and hammocks from the locals. Valladolid is also a great place to just walk around and admire the pastel-coloured colonial buildings. Walking through some of the residential neighbourhoods near Hostel La Candelaria was interesting, to see the types of homes that the locals live in and just observe the culture around you. I loved checking out some of the local specialized shops, like paleterias/neverias (ice cream and popsicle shop), floreria (flowers), papeleria (paper shop/stationary), tortilleria (tortilla shop), ferreteria (car repair shop) and more. Valladolid does not have too much American influence (yet), which I enjoyed. All of their clothing stores and specialized shops are locally owned. There are no American chain stores or large department stores, except for the one Domino’s Pizza that I saw near the central park. Coca Cola does have a large presence in Mexico everywhere, from the tables and chairs at local restaurants to glass bottles of Coke being sold and consumed everywhere. Valladolid feels very authentic, and it is difficult to find people who speak English. I enjoyed the challenge of being forced to practice my Spanish, everywhere I went. The staff at Hostel La Candelaria speak English, however, many shop owners, restaurant staff and transportation staff do not. I was in need of band-aids and a nail clipper and had to perform charades at the local pharmacy because I did not remember the Spanish translation for what I needed. Thankfully, the staff understood what I was looking for and helped me to find it. I highly recommend visiting this sleepy colonial city with so much small town charm in the Yucatan! I also recommend staying here for more than just one night (as most tourists to the city only stay 1-2 nights in order to be in a central location and in close proximity for visiting the nearby ruins of Chichen Itza, Ek Balam and various cenotes). Valladolid is a wonderful city to explore and it definitely deserves more than just a stopover! Have you been to Valladolid? What did you love about the city? Would you return for another visit? Thanks for that amazing guide with all these great photos. I’ll definitely bookmark it, so I’ll have the chance to reread it when I’ll be travelling to Mexico for the first time. Thanks so much! Hi Moritz! Thanks so much for that nice comment and for reading my guide. I’m so excited for you on your first journey to Mexico! I hope it’s the first of many for you. I’m glad you found my guide helpful 🙂 All the best on your future travels! So happy to read that you also enjoyed Valladolid, and that La Candelaria is still going strong, five years after we stayed there!! 🙂 Your guide is excellent! No problem! La Candelaria was amazing as was Valladolid 🙂 Thank you so much! I have a home in Cozumel and have always thought about going to Valladolid. This pretty much convinced me to make a side trip there for a couple of days. Thank you! Thank you Mark! I am glad you made the decision to check out Valladolid. It’s such a wonderful place. I am in the process of writing up a new and improved guide to the city over at my new blog http://www.brittanymthiessen.com. I don’t update this blog anymore, so check out my new one for more recent articles, if you’re interested! Your blog is turning into my bible:) I have already bookmarked your Izmal post. Thank you so much for this post… it was incredibly helpful to me in planning my visit to Valladolid later this month. Your mention of MexiGo tours was particularly useful as for some reason they were not on my radar at all but I am now planning to do two day tours with them! Will delve into your other Yucatan articles next! Gracias, chica! Heading to the Yucatan in January 2019 (third trip). This time we are flying into Cancun, taking the ADO bus down to Playa del Carmen where we will rent a car and head west. First stop is Valladolid for three nights, on to Santa Elena for three nights, back to Valladolid for one night and returning to Playa to drop off the car. From there it is over to Cozumel for seven days! Thank you for your “review” of Valladolid. It is great and has given me some fantastic information. We are staying at the La Aurora Hotel Colonial on Calle 42. This is a very complete information on how to do day trip to Chichen Itza. And I believe this is the first time I read about Group of the Thousand Columns. Hi Brittany! I am planning a trip with my friend to the Yucatan and we are deciding how long to spend in Valladolid. We plan to stay 2-3 nights, it looks like a beautiful city! Thank you for your recommendations.